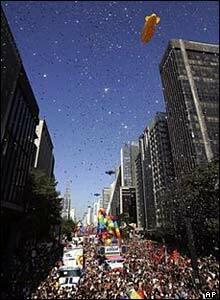 More than 2.4million people have gathered in Sao Paulo for the 10th annual Sao Paulo Gay Pride Parade gathered. 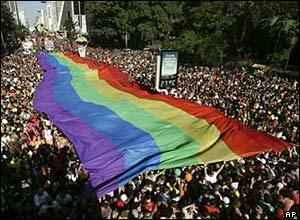 This annual event was held in June, the Gay Pride Month. The theme for this year event was called ‘Homophobia is a crime’. This event has abandoned the speeches and has turned into one of the biggest parties in the city. 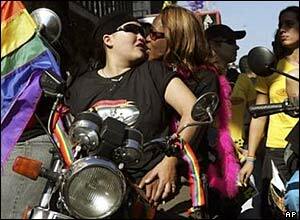 Millions of gays, lesbians, transgenders and bisexuals were sent to the street. The protesting banners and cars manifesting creative phrases about the homosexual condition were gone and were replaced by a carnival of techno music, with ‘trio eletricos’ hanging big displays of its corporate sponsors. 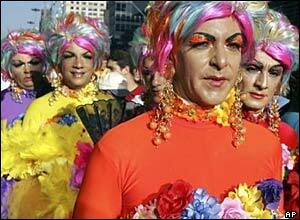 There are 58 pride parades was scheduled to happen this year in Brazil. Most of these parades are sponsored by the government. The unusual model has its supporters and also its detractors. 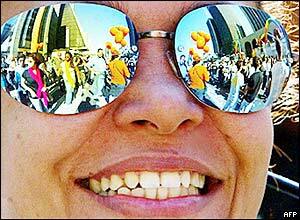 There are debates about these parades may indicate a deeper cultural clash. For instance, there are two opposing tribes that almost met on the same avenue in São Paulo this year — the gays and the evangelicals. The mainstream media seem to be giving a low profile to both of these cultural movements until now, perhaps because Brazil as a nation contains a strong Catholic influence. This ambivalence has raised protests from both sides who firmly believe they should be the ones to be supported. This entry was posted on Monday, December 11th, 2006 at 12:20 pm	and is filed under Interesting Stuff. You can leave a response, or trackback from your own site.